If you’re reading this expecting a restaurant food and service review, you might be disappointed. 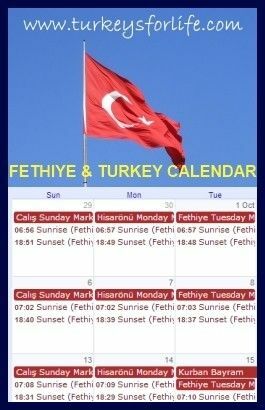 As is the norm on Turkey’s For Life, we’re merely reporting a particular event in one of our days. The day I’m writing about here is the day Turkey’s Prime Minister, Tayyip Recep Erdoğan, paid a visit to Fethiye. The day began with a bit of a buzz. ‘Oooooh, let’s go into Fethiye to see what all the fuss is about.’ And then we went into Fethiye, camera in bag, to see what all the fuss was about. Police, police helicopters, snipers, roadblocks, body searches if you wanted to pass into the viewing area. The reality didn’t compete very well with whatever we were expecting (what exactly were we expecting?) so we took ourselves off into old Fethiye, away from the action. We were out and about anyway, it was glorious, crispy winter weather, so why not make the most of it? The exciting bit – would you turn away at this point? …You’ve got to admit, this is a pretty decent entrance to any restaurant! Walk down the steps, towards the doorway and you can see Fethiye and the bay slowly appearing before you. The building itself is a rather narrow half-moon shape with ornate, wooden ceiling à la Akyaka and a large, open kitchen. The outside, as you can see, is a vast, open courtyard with tables around the edge of the cliff face. Any slight breeze and you can hear the rapid flapping of the Turkish flag. Amazing panoramic views over Fethiye bay. The odd thing with Fethiye is, when it comes to restaurants, no one has ever set their stall out and claimed to be a gourmet, top end establishment. It will come; we’re convinced. For now though, we can sit and ponder life and gush over these views whilst enjoying our 5 lira Efes Pilsen! While the prime minister spoke to his listeners along the harbour below, we mooched around Fethiye’s rock tombs and the castle and then quenched our thirst at Kale Park…and we weren’t the only escapees to end up there! I just added Fethiye Bay into my list of places to see before I die! I am surprised to know that the bay is actually so big! @ London Caller: Everyone should see Fethiye before they die! 🙂 And yes, it is bigger then people think – and growing every day. @ Corinne: We see it every day and are still amazed when we see it from above like this. A little piece of paradise – with affordable Efes. That is a great entrance to a restaurant! With a view like that and Pilsens to drink down, it would make it a fun way to spend the day. @ Steve: Efes Pilsen usually has a part to play in our fun days. It is a great entrance isn’t it?! I am from Turkey but I haven’t been in Fethiye/Mugla before. Thanks to your amazing pictures, Now I wanna be there as soon as possible…thanks for sharing! @ Hulya: Thanks for your comment and compliment. Yes, you must try to make it to Fethiye. It’s beautiful!